Prior to his move to Toronto, Mr. Gefter held the position of Associate Principal Cello with the Fort Worth Symphony Orchestra. While still a student at The Juilliard School in New York, Igor was invited to play in the cello section of the New York Philharmonic; serving as an acting member and an extra cellist, this special relationship lasted for over eight years. Highly regarded for his expertise as an orchestral player, Mr Gefter has been invited to perform with the Boston, Chicago, and Detroit Symphony Orchestras. In 2009 Mr Gefter was invited by the Seattle Symphony to serve as a guest principal cellist in the opening week of the 2009–10 season. Mr Gefter's numerous honours include multiple Chalmers Performing Arts Awards from the Ontario Arts Council as well as four consecutive B-Grants from the Canada Council for the Arts to study abroad. In 1997 Igor was a recipient of the John B.C. Watkins Fellowship from the Canada Council. In 1991 Mr Gefter won first prize in the Canadian Music Competition, which resulted in numerous recitals throughout Canada. While studying in New York, he won the Mannes Concerto Competition and performed as a soloist at Lincoln Center's Alice Tully Hall. 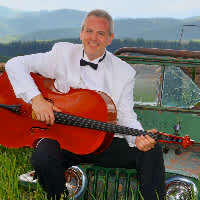 An active participant in international music festivals, Mr Gefter serves as principal cellist for the Grand Teton Music Festival in Wyoming every summer. In the past, Igor has served as principal cellist for the "Festival of the Two Worlds" in Spoleto, Italy, the International Chamber Music Festival in Venezuela, and the International Symphony Orchestra in Israel. Igor made his début at the age of eight as a winner of the National Young Artist Competition, the first of seven consecutive competitions that he won before the age of 13. At 14, as one of the most distinguished young cellists in Russia, he was chosen to perform at the Recital Hall of the Moscow Conservatory. Mr Gefter holds Bachelor and Master of Music degrees from The Juilliard School, where he studied with Harvey Shapiro and Aldo Parisot. He completed his post-graduate studies in the studio of Carter Brey. Igor enjoys spending time with his wife, Kristina, his son, Daniel and his daughter, Eliana. His hobbies include reading, photography and technology. Mr Gefter performs on a wonderful Christopher Dungey cello, made especially for him in 2013.